Battery arrived as promised fitted correctly and worked since. Clear website, reasonable prices, very quick delivery, carfully packaged, quality product. Just the job. 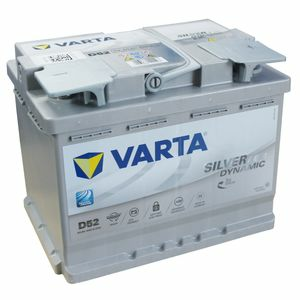 Great price for a premium battery and next-day delivery. Quickly fitted and so far performing very well. Great product and the lowest price around, good customer service and quick delivery, thank you. Excellent service from Tayna. Very fast delivery. I will use them again. Excellent service, item we'll packaged. Arrived next day. Brilliant!! Orded late Friday night and here 1st thing on Saturday morning. Top Job Guys! Very good battery. My stop start works again ! This battery appears to be a very good battery so far I am well pleased. Bought this for our Silver Shadow. It withstood long periods of idleness, and coped with a lot of cranking until I had sorted out the various cold-starting problems. Despite being in the boot with consequent voltage drop over a long cable, it turned the 6.2 litre engine very well. Good battery. I chose this AGM battery because I wanted something reliable and well made. This isn't a cheap battery, however, I'm of the opinion that you get what you pay for. I'm hoping this battery will give me many years trouble free service. The 5 year warranty is a great bonus too.